You pick up the vibe of the carnival straight away by visiting Rio, city of great festive occasions. 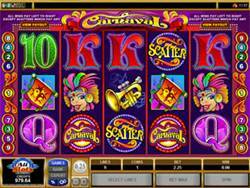 Carnaval Slot is a 5 reel 9 pay line game and Microgaming have provided dazzling graphics and include symbols like Wild and Scatter, which are self evident, as well as the Carnaval logo, the Lady, the Clown and a Trumpet as well as Ace through to 10. Although it does not have an actual bonus feature, the scatters and wilds appear so often that you don’t really miss a bonus feature. The Wild symbol substitutes for all others except the Scatter and really enhances your winning potential. To win the highest Jackpot with a $5.00 coin on one line you are rewarded with a windfall of $25, 000, 00. When you pull 5 Carnaval Logos whilst 4 of them will earn $4000.00 with the same value bet. Should you trigger 3, 4 or 5 Scatter symbols you get a multiple of 2x or 10x or 50x, so again if you bet the maximum bet of $45.00 on 9 lines a prize of $ 2250.00 could be yours. Join in the Carnaval and make good money!